2017 Trek Red Truck camp took place in Palm Springs at the end of March. During the four-day camp the racers, masters, and sponsors took full advantage of the sunny weather leaving behind the rain in Vancouver! I would first like to say a massive thank you to the sponsors for financially aiding the racers so that they were able to attend camp. We would not be able to go on these incredible trips without your assistance. Again, a big thank you! Another thank you to Steve, Evan, and Leah who coordinated the camp’s logistics, rides, and everything else you could think of in order to make the camp run as smoothly as possible. And lastly, thank you to all my fellow teammates that made this camp extremely fun on and off the bike! With only being in Palm Springs for four days, we wanted to maximize our riding days, especially with the beautiful weather Palm Springs had to offer. The first day was going to be a hard ride, not only in distance but the wind and the +40 degree temperatures would make it a challenging day. On the agenda was Box Canyon. The men’s team planned to do 200km while the women planned a 160km ride. The ride out was mostly through residential areas and the city. Once we hit about 80km, we arrived at Box Canyon. The ride up the Canyon was gradual with no major kickers or steep sections. It was a great climb for a steady and comfortable pace. As well, the views riding up were incredible; it is amazing what you can see riding your bike! Once we regrouped, we rode down the Canyon and the men continued their ride and the women’s team rode together. We finished our ride in a small strip mall where we re-fueled from riding in the heat and Leah came to pick us up. Overall, the first day of camp was awesome! The riding in Palm Springs was promising with great roads and sunny days. The rest of the time was spent relaxing by the pool and getting ready for another long ride the next day! Unfortunately, I wasn’t able to spend too much time at the pool, still being in school, I had to make sure I kept up with my studies! We were also lucky enough to have a great BBQ dinner provided by the Rivera Hotel where we were staying. During dinner, “Riders of the Day” were awarded. This was given to a rider that dug deep and had a great day training! On the men’s side, the award was given to Kurt Penno, who was also celebrating his 18th Birthday! And on the women’s side, it was given to our team mentor, Anika Todd. Anika showed great strength and perseverance riding that day! Anika rode mostly with the men the whole day (not an easy pace!!) and almost did the whole 200km, but with a wind warning and only being able to go 11km an hour in a head wind solo, Anika completed 175km!! long descent with 40km of rolling roads and then back into the city. I have to say this was my favourite ride of the camp. We banked another 135km of great riding in Palm Springs. Again, like the first day you would find the TRT group down at the pool soaking up the sun. “Riders of the Day” were awarded again. On the men’s side, the award was given to Kyle Bukowski and I won on the women’s side. We were again treated to another great Mexican dinner. Team dinners were a great way for everyone to interact with the team and sponsors! Day 3 was the last day of riding in Palm Springs, it was a shorter route but not an easy one. We started at the hotel and rode out to Fish Hatchery and then did the Tram Climb. Fish Hatchery was another gradual climb and a nice road to put in a hard effort. Once we completed that climb, we again regrouped and rode to the Tram Climb. A few of my teammates who have ridden in Palm Springs before told me that the Tram Climb was going to be hard and steep but would definitely not disappoint. They were right! The Tram Climb was hard, but I loved it! My personal favourite type of climb is hard, punchy and steep and the Tram was exactly that! Everyone was thankful when we got to the top, but still in good spirits to take a group shot. All smiles after completing the Tram Climb in 40 degree temperatures! After the ride, we were treated with an incredible Duck Lunch. The Duck Lunch is a tradition at the TRT camp and this year the racers had the pleasure of joining the sponsors for the lunch. I would like to give a huge thank you to the sponsors for having the racers join the special duck lunch! It was delicious! After we ate lunch, we rode quickly back to the hotel to soak in the last bit of sun before heading home! Full TRT team enjoying the Duck Lunch! I would again like to thank the sponsors, Leah, Steve and Evan for coordinating a fantastic team camp. This was my second TRT camp and just like the last, I had a great time meeting teammates and going on challenging rides with a great group of people. I am very excited for the 2017 season. 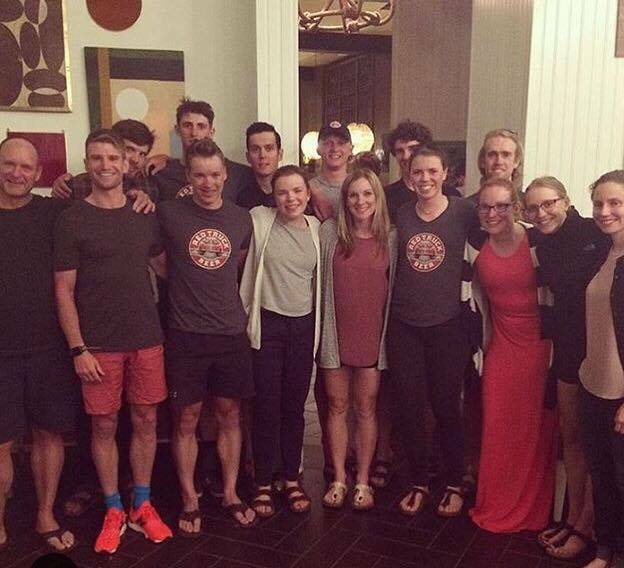 The men’s and women’s teams are strong, ambitious and ready for results this season!